Regiment/Service:Northumberland Fusiliers 22nd (Tyneside Scottish) Bn. Grave Reference: IX. G. 18. Cemetery:COLOGNE SOUTHERN CEMETERY. Regiment/Service:Royal Army Service Corps 165th Horse Transport Coy. Additional Information:Son of James Drummond, of Blairgowrie, Perthshire. Son of John and Catherine Young, of Glasgow. Income Tax Office Clerk of Glasgow. Information:Son of James and Mary Aird, of Glasgow; husband of Martha Aird, of 430, South Wellington St., South Side, Glasgow. Regiment/Service:Labour Corps 257th Area Employment Coy. Additional Information:Son of Robert Milmine, of 706, Dalmarnock Rd., Bridgeton, Glasgow. Additional Information:Son of Neil Alexander Love McEachran and Ellen Florence Warren McEachran, of Homelands, Thorntonhall, Glasgow. M.A. of Glasgow University and a Bursar. Additional Information:Son of Walter and Margaret Meiklem, of Drumry Cottage, Drumchapel, Glasgow. Native of Dumbartonshire. Regiment/Service:West Yorkshire Regiment (Prince of Wales's Own) 4th Bn. attd. 6th Bn. Additional Information:Son of James and Isabella Jamieson, of Cambuslang; husband of Christina E. Jamieson, of 45, Park St., Cambuslang, Glasgow. Regiment/Service:Royal Garrison Artillery 1st Siege Bty. Additional Information:Son of Mr. and Mrs. Hugh McPhee, of 94, High St., Ayr; husband of Stella Walker McPhee, of 13, Langside Place, Langside, Glasgow. Regiment/Service:Royal Garrison Artillery 71st Heavy Bty. 21st Bde. Additional Information:Son of David and Frances Rankine Dow, of Falkirk; husband of Elizabeth G. Barr Dow, of 2, Edmiston Drive, Ibrox, Glasgow. Regiment/Service:Royal Artillery 347 Bty., 111 H.A.A. Regt. Grave Reference: Plot 3. Row AA. Additional Information:Son of Owen and Rose Hunt, of Edinburgh; husband of Ivy Hunt, of Edinburgh. 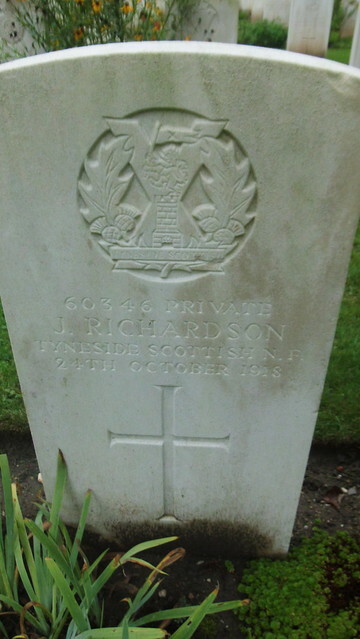 Additional Information:Son of Alexander and Marion Blyth, of Edinburgh; husband of Helen Blyth, of Edinburgh. Regiment/Service:Machine Gun Corps (Infantry) 29th Bn. Additional Information:Son of Joanna Brough, of 10, North Richmond St., Edinburgh, and the late George Brough.